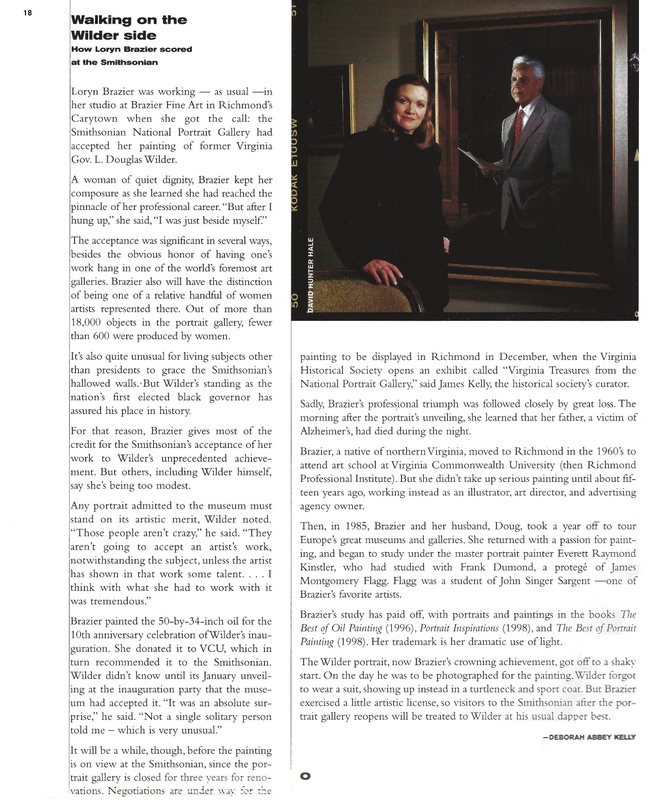 Brazier's official Portraits hang in government, corporate, academic and religious institutions across the country. Nearly 150 public figures have been her subjects. She is in the permanent collections of the Smithsonian National Portrait Gallery and The National Museum of Women in the Arts, both in Washington, D.C.
She has won awards on four occasions from the Portrait Society of America and her work has been published in several art magazines and books. As well as portrait work, she is an avid painter of landscapes, still life and figurative subjects and is a member of Plein Air Painters of the Southeast. She is the founder of Plein Air Richmond. Loryn has owned Brazier Gallery for over 17 years Prior to that she had owned an advertising agency and was also an illustrator. Her work has been profoundly influenced by artists such as P.S. Kroyer, John Singer Sargent, Cecelia Beaux, Joaquin Sorolla and by her former teacher and valued friend, Everett Raymond Kinstler. 2009 Expressions Portrait Competition, ArtSpace Herndon, "First Place"
2007 The National Arts Club Fifth Annual Open Online Exhibition, Visual Arts Award "First Prize"
Apr 2003 Portrait Society of America, International Portrait Competition, "Honors Award"
2002 Portrait Society of America, International Portrait Competition, "Award of Merit"
Apr 2001 Portrait Society of America, International Portrait Competition, "Award of Merit"
Apr 2001 Portrait Society of America, International Portrait Competition, "Portfolio Award"
Mar 2000 Richmond Magazine, "Walking on the Wilder Side; How Loryn Brazier Scored at the Smithsonian"
All Portraits are done in oil on canvas or linen. Portrait cost is determined by the portion of the figure in the painting rather than the painting size. Portraits will be life size or under. (Except in special circumstances, larger than life size figures appear unnatural.) Travel and expenses are additional charges. One-third payment deposit is requested with the signing of the contract and establishes a place on the artist's waiting list/calendar. An additional one-third is requested when work begins and the final one-third, plus the tax on the whole, is paid at the time of delivery. You will receive statements as these payments come due. Prices listed do not include frames. If the client wishes, the artist will be glad to assist in the frame selection.